The Pearstone 11" Articulating Arm is an arm used to mount small displays on prosumer and professional camcorders. The arm's unique design features a single-point locking mechanism, which gives the user maximum flexibility. Moving the display on multiple axes is quick and easy, allowing users to find the best possible viewing angle. In addition, the bottom verticle spacer piece is removeable to reveal a 1/4"-20 male screw, and the bottom shoe mount is removeable to reveal a 1/4"-20 female thread. The full length of this arm (tip-to-tip) measures 11", and the usable extension range (end-joint to end-joint) measures 8.3". Box Dimensions (LxWxH) 7.65 x 2.9 x 1.75"
11" Articulating Arm is rated 3.9 out of 5 by 134. Rated 3 out of 5 by Gavin from Solidly made, and yet too loose The arm itself is sturdy and the locking mechanism holds the arms in position securely. You can remove the cold-shoe assembly from the end, leaving plain screws and plastic collars at each end, which increases the arm's versatility. However, the screw assemblies at each end cannot be tightened enough to prevent the arm or the attached device from spinning around. It would have been better to integrate a hard rubber pad or some surface with friction to prevent this. This flaw greatly reduces the usability of the arm. I was planning to use this to attach an F&V viewfinder to a BlackMagic camera. I'll probably have to fabricate a custom bracket of some kind instead. Rated 2 out of 5 by Jason from Broke within first two days Product seemed like a great deal for the price they are offering. But the whole system couldn't keep a tight lock to my C100. The arm itself would lock well but then would slip and the whole arm would swing to the right. And it also seems there is an unnecessary amount of parts towards the bottom where it connects to the camera. Like 4 different things you can tighten and I was never able to find the right combo to make it lock securely. Then the top ball barring assembly broken and feel apart. Just a shame that not even a week after I received it it broke. May not be the same case for everyone but just some thoughts. Rated 2 out of 5 by Evan J from Can't handle 2 pound weight! Well I was looking at the description and I thought I can use this to handle my ATOMOS Shogun which weight total 2 pound. But when I am using it for 10 min it starting to come down and one time almost drop my shogun. I return the item and replace the new one hopefully it just unlucky bad item that they gave me. Rated 3 out of 5 by Filmydude from Decent for the price It does what it says, but the ball joint locks are a bit weak unless you crank the tightening dial so hard it feels like it's going to break. Also it tends to loosen on it's own after a while. I don't think it's necessarily a flaw so much as a product of it's simple design. On the plus side, it feels well made, sturdy construction and if you aren't holding something heavy (I'm using a 7 Ikan D7W monitor in the field) it likely works well. Anything over about 3/4lbs is apparently a bit too heavy. Rated 3 out of 5 by Vixter101 from Okay for lightweight accessories I purchased, along with a Nano Clamp, for holding an external monitor for my T3i. This arm didn't cut it. It couldn't hold the monitor and kept slipping. Also, it kept unscrewing at the base. I was disappointed when I started using it, especially since there were many reviews here that said it was really strong. Not sure what everyone else is using it for, but for me it didn't work. It's okay for lightweight stuff, like microphones or lights. It may work for my H4n. How many pounds will this hold? Thanks. 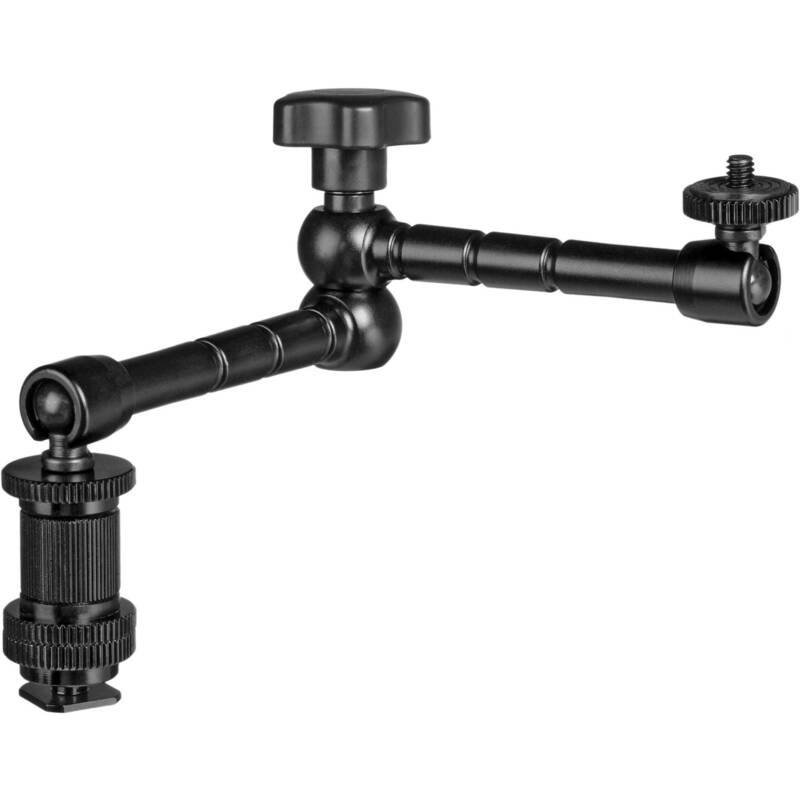 Though not rated for weight load, this arm will work with products like 7 video monitors. So no more than 3 lbs. How do I get a new one? Mine broke after 5 months of light use. I have the SmallHD 701 lite, will this support the monitor? Hello Jacob, I am sorry to say that we are a big company and no one here seems to recall what we purchased this item for. We do a lot of prototype items, so it was more than likely for one of those.sorry I couldn't be of more help. How do you prevent the ends from flopping around? The joints on the end don't look like they lock. They spin and swivel freely. I have an identical item and I don't know how to get it to hold my monitor without falling over. Tighten the knob more. It locks all of the moving parts.